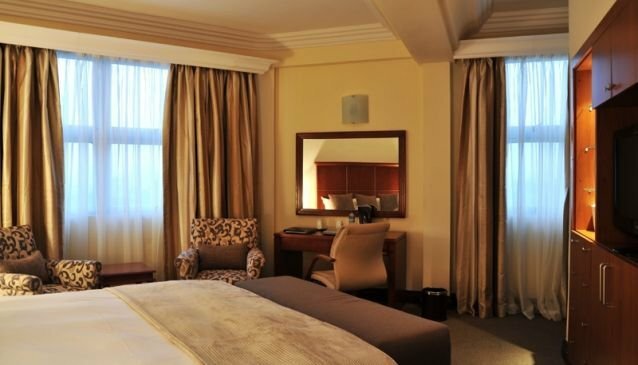 Protea Hotel Ikoyi Westwood is situated in the heart of the busy business centre of Ikoyi, on the waterfront of the Cowrie Creek Lagoon, with its own jetty. This 10 story building offers 18 Suites, 20 Deluxe Rooms and 18 Standards Rooms, all fitted with a limited DSTV bouquet, state-of-the-art furnishings and Internet access. Other facilities include a fitness centre, pool, bar, lounge and a speciality restaurant. The hotel can also be used for business meetings, AGMs, events and so on as they have halls and meeting rooms to fit any occasion. Standard Room: Queen size bed, LCD TV. Bathrooms are fitted with a shower only, vanity and toilet. Deluxe Room: King size bed, LCD TV, mini fridge and ensuite bathroom. Suites: Lounge area and bedroom. The bathrooms have a walk-in shower. The restaurant has both Nigerian and Continental menus. It opens for breakfast by 6:30 am and closes at 10:30am while dinner goes from 6:30pm to 10:30pm. The bar is has some fancy wines and is open all day.